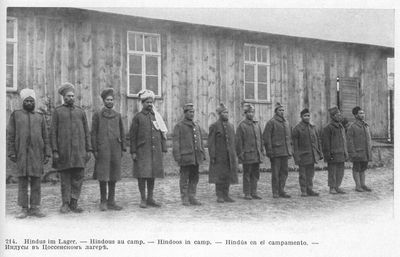 Ten Indian prisoners of war stand at attention outside of their barrack, probably at the prison camp at Zossen-Wuensdorf. These men came from the breadth of the Indian Empire and included both Hindus and Muslims. The Germans used photographs of these men to show the Germans that they were essentially fighting the world and to counter Allied propaganda that the Entente was fighting for democracy and freedom while utilizing subjugated colonial soldiers in their struggle.